Plants are fundamental players in human lives, underpinning our food supply and contributing to the air we breathe, but they are easy to take for granted and have received insufficient attention in the social sciences. This book advances understanding of human-plant relations using the example of wheat. 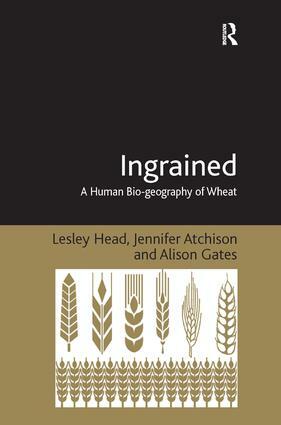 Theoretically, this book develops new insights by bringing together human geography, biogeography and archaeology to provide a long term perspective on human-wheat relations. Although the relational, more-than-human turn in the social sciences has seen a number of plant-related studies, these have not yet fully engaged with the question of what it means to be a plant. The book draws on diverse literatures to tackle this question, advancing thinking about how plants act in their worlds, and how we can better understand our shared worlds. Empirically, the book reports original ethnographic research on wheat production, processing and consumption in a context of globalisation, drought and climate change and traces the complex networks of wheat using a methodology of 'following' it and its people. The ethnobotanical study captures a number of moments in the life of Australian wheat; on the farm, at the supermarket, in the lives of coeliac sufferers, in laboratories and in industrial factories. This study demands new ways of thinking about wheat geographies, going beyond the rural landscape to urban and industrial frontiers, and being simultaneously local and global in perspective and connection.